Nice old heavy camera lens. In original box. I don’t know much about cameras and even less about lenses. Found this at an estate sale. The wood velvet lined box tells me it’s old. Can’t tell you if the lens works because I have no way to test it. So selling-as is. Has a nice leather lens cap that’s lined with blue velvet. The glass lens doesn’t appear to be scratched. But may have surface flaws that I can’t see. The lever on the side of the lens, works as it should. To me it appears to be in good condition and well taken care of through the years. It’s old though. And old things are never perfect. Lens has surface wear on the metal. The box has wear and surface scratching. Also, the box is missing the top hinge. Please look at photos for condition. Thanks for bidding. Canon FL 19mm f3.5 R Retrofocus Wide Angle Lens. Personally, I would not hesitate to use this lens. There is no fungus. Elgeet 13mm Wide Angle F 1.5. Focusing and aperture work fine. Serial Number 3172. C Mount Lens in Mint Condition. This is a screw mount, 16mm film or similar. manual aperture lens for the. Here is a lot of 3 vintage C mount cine camera lenses. The lenses are a Bell & Howell Comat 1 Inch f2.5. The diaphragm works fine. The next is a Bell & Howell Super Comat .7 Inch f2.5. The focus and diaphragm work fine. It comes with a lens hood and filter attachment. The last lens is a Wollensak Cine Velostigmat 1 Inch focus f3.5. The diaphragm works fine. The glass shows wear on the Wollensak but the two Bell & Howell lenses look clean and clear. A nice vintage lot. 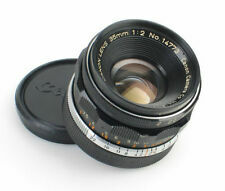 Check out my other auctions for more Cine Lens lots for both D Mount lenses and C Mount lenses. I can combine shipping on multiple purchases. Buyer pays shipping and the shipping quote includes insurance. Brass Vintage Lens. Shipped with USPS First Class Package. Glass looks clean and clear one small ding in front element apture working well, not sur what size? This lens was made by the Tokyo Opt. The serial number is 563556. The lens focus and diaphragm are working smoothly. There is no oil on the blades. No fungus, haze or separation. In my opinion this lens will produce an excellent image, but the glass is NOT mint. Bausch and Lomb 75mm f2.3 Baltar Lens Cell Serial# 981GF. Lens Focus:NO FOCUS RING. Lens cell only. Condition : Lens is in Very Good Used Condition. Lens Aperture : Aperture ring turns smoothly. Aperture Blades are Clean. 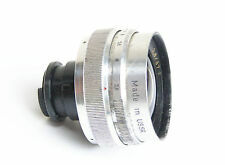 Bausch and Lomb 75mm f2.3 Baltar Lens Cell Serial# HF262. Lens Focus:NO FOCUS RING. Lens cell only. Condition : Lens is in Very Good Used Condition. Lens Aperture : Aperture ring turns smoothly. Aperture Blades are Clean. This item is Previously Lightly Used, and in Great Working Condition. All as pictured. NO EXCEPTIONS, GOOD LUCK!! Both images were shot in natural light 4/3/2019 into Fujifilm 200, 1/1000 sec., f/8 with my M3. Film was processed and the images were put onto a DVD by Dale Labs of Hollywood, Florida. The first image was through the Elmar. Front lens cap. Rear lens cap. I cleaned the lens by the disinfectant. No noticeable scratches on the lens. No fungus or haze inside the lens. No balsam separation inside the lens. The mount is clean. Shows use on outside, lens is clean with no scratches and minimal dust - see photos. Up for sale is another lens from my uncle's collection. I had it CLA'd at Leica specialist YYe Camera, outside Boston. It is in good working condition for a lens of this age. The body shows some wear from use, but the focus and aperture rings turn very smoothly. The glass is decent, although there is still some dust and what appear to be light cleaning marks in the elements. Note: it is a very old lens. No reserve, no returns, no international shipping. If you are local to New York City, we can arrange a meetup for local pickup. Please message with any questions. Optics are clean, with no signs of external or internal flaws. Lens capes not included. Service sets us apart. We have been family owned since 1914 and stand behind every sale we make. It works well with a clean diaphragm and smooth focus. Som Berthiot Paris Cinor 75mm F3.5. Focusing and aperture work fine. C Mount Lens. This is a screw mount, 16mm film or similar. manual aperture lens for the. Up for sale is a Rare CANON SUPER CANOMATIC R 58mm f/1.2 Fast Lens for Parts or Repair. Focusing is stiff. Couldn't get it to move. There is Wear on rear mount and a ding on the rear mount. No Haze or Fungus. Wollensak Pro Raptar 152mm f2.7 Lens Serial# E27710. This lens is an unknown mount. Lens Focus: Focus ring turns smoothlybut is a little stiff. Lens Aperture : Aperture ring turns smoothly. Aperture Blades are Clean. Only a tiny mark on rear glass, no impact on picture quality. It'll take great picture. It covers 4x5, possibly 5x7 (?). Optically clean, no scratches no fungus. Shutter - Alphax Synchromatic, works at all speeds. Front barrel is pitted. Makeshift rear cap. Heavy lens, weighs 2-1/3 lbs (1002 g). This lens has an Arriflex mount. Lens Focus: Focus ring turns smoothly. Lens Aperture : Aperture ring turns smoothly. They are not NEW and will not be perfect. You might see reflections in the glass. 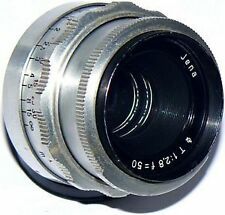 CARL ZEISS JENA, TESSAR 50mm f/3.5 T lens w/ EXAKTA mount. Beautiful! This is a CARL ZEISS JENA, TESSAR 50mm f/3.5 T lens with EXAKTA mount. Its in excellent condition. The glass is clear with no scratches, cloudiness or fungus. The aperture is clean and smooth and the focus is smooth. This is a Leica M39 Threadmount 5cm f/1.5 Summarit lens. 1st Version. Made in Wetzlar, Germany in 1951. Serial number 892439. The lens you see is the lens you get. Regards, Darryl. I speak Leica. It's in nice condition. The box is worn, but still together. The case is solid with just light to moderate wear. The lens cap shows a little wear and the lens looks really nice even when viewed very closely. Bausch and Lomb 152mm f2.7 Baltar Lens Serial# BR6718. This lens is an unknown mount. Condition : Lens is in Very Good Used Condition. Barrel: In Good used condition. Lens Focus: Focus ring turns smoothly. I believe this is a usable lens. Here is a lot of 4 vintage D Mount 8mm lenses. They are from various brands. I checked the focus and diaphragm but I have not tried to clean the glass. They are sold "as-is". They are as follows, Cine Nikkor Revere C f1.9 13mm where the focus and diaphragm work, a wide angle Kaligar f1.9 6.5mmwhere the focus and diaphragm work, a Kinotar wide angle 6mm f1.9 where the diaphragm is stiff but works, and a Elgeet f2.5 7mm wide angle lens where the diaphragm works. 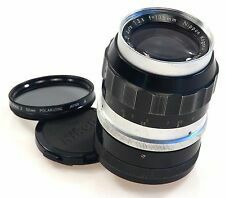 Check out my other auctions for more Cine Lens lots for both D Mount lenses and C Mount lenses. I can combine shipping on multiple purchases. Buyer pays shipping and the shipping quote includes insurance. Mamiya C33 Lens 135mm F-4.5 . Excellent physical shape. Light haze in viewfinder lens only. Shipped with USPS Priority Mail. No international shipping. The lens is in excellent condition. Hardly a mark on it. This is a really nice lens. This item is Previously Lightly Used, and in Great Working Condition. This Lens does show signs of wear and tear. All as pictured. NO EXCEPTIONS, GOOD LUCK!! The Zeiss aluminum front lens cap does have an edge ding but the back cap and original soft leather pouch case are good. Rare Vintage Soligar H 35mm 2.8 PreSet Lens. T mount. In very nice condition physically for it's age. Adapted to Miranda M44 thread mount. Adapter can be removed. Maybe you have an M42 adapter?. Glass looks great, clean! Aperture blades clean. Focus "slightly" stiff but smooth. Color variations can occur dependent upon viewer's screen. Lens is in good used condition with optics that NO HAZE OR FUNGUS. Aperture works fine and lens focus is still smooth. Lens is a screw mount. Clean example. Very minor wear on the barrel. Lens is numbered 1987347. Beautiful lens. F 16 to F 64. Still a very usable lens. Lens Glass. This lens is an unknown mount. Lens Focus: Focus ring turns smoothly. Lens Aperture : Aperture ring turns smoothly. They are not NEW and will not be perfect. You might see reflections in the glass. New ListingRare Yashica Yashinon-R 90-190mm 5.8 lens and case. Exc. cond. Minolta MC mount. Shows very little use, if any. Glass clean, no fogging, fungus or scratches. This lens is not an auto lens, it's of preset design. Focuses smoothly. Zoom is stiff but smooth. For those who don't know this lens you have to pull back on the aperture ring to set the aperture. Tested & functional both aperture and focus work; glass is hazy. Any item sold by the Seattle Goodwill is eligible for local pick up at our warehouse. Net proceeds from the sale of these goods and financial donations from the community make it possible for us to operate our free job training programs. Birns and Sawyer Hollywood 200mm f3.2 Lens Serial# 120510. This lens is an unknown mount. Lens Focus: Focus ring turns smoothly. Lens Aperture : Aperture ring turns smoothlybut is a little stiff. up for auction is a Turner Reich Triple Convertable 5x8 Lens: 5 &7/8", 14", 20" focal lengths. The front element is rough but the rear is clear and excellent. All three focal lengths looked equally amazing and consistent to me when I tried this out. Still a performer at a low cost. This Ilex ACME syncro shutter is built like a tank and is working perfectly. All speeds sound accurate. This is a great shutter. Shipped with USPS Priority Mail. There's typical cement seepage at the edge of elements, see photos, does not effect use. Maximum apertures for each focal legths are f:6.8, f:12.5 and f:16 respectively, see close up photo. Front cap is included. Should have no effect. Very light internal haze. Clean example. Lens is numbered 208885. A few little rough spots on the front edge of the front rim of the lens barrel. Kern Paillard YVAR 75mm f/2.5. Focusing and aperture work good. C Mount Lens. This is a screw mount, 16mm film or similar. manual aperture lens for the. Schacht F2.8/50R Macro copier lenses. High Quality German optics. Always stored with a clear filter over the lense & both cap in case. Pentax thread. Excellent condition Shipped with USPS Priority Mail. 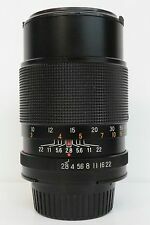 Nikon Nikkor LW 28mm f2.8 s#283617 includes front and rear caps in excellent condition. Free usps priority mail shipping. Rare Yashica Yashinon-R 90-190mm 5.8 lens and case. Exc. cond. Minolta MC mount.